George Lucas’s Star Wars is the most popular and influential adventure series in the history of film. William Shakespeare’s Hamlet is the most highly regarded play in the history of theater. Both traffic heavily in deep spiritual concepts and both have enthralled a myriad of audiences. Stage director-writer Brad Erickson’s mash-up of the two was a smash hit at the 2011 Minnesota Fringe Festival and now the Dana’s Boys group has remounted it at the Phoenix Theater. Jay Kistler plays the title role. There is massive audience for all things Star Wars. One is struck by the downright devotedness that so many people have to the players in that galaxy far, far away. Not to mention, Shakespeare. So I ran this past Brad Erickson. JT: The power of Star Wars sometimes seems as powerful as major belief systems in the world. People relate to it on some deep core level. “The Force” is felt by some to be a truly real cosmic power force. BE: I think The Force can be considered real and powerful mostly since it supports the belief that there is a light and a dark side to people, ideas, and situations. Maybe not the levitation nor the telepathic powers in a literal sense, but the ideas that cloudy judgments can be shaped and clarified when we are calm and peaceful. In the case of the films, it also acknowledges that good people can fall victim to greed and power, yet be brought back from darkness. Most of the events of Lucas’ original Star Wars trilogy are driven by the idea of redemption. 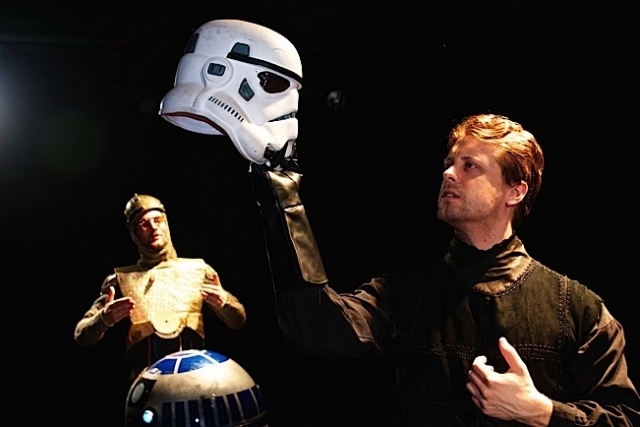 JT: The idealism of Star Wars, the majesty of Shakespeare, and the purpose of a young man’s life all seem like a serendipitous mix for a stage play. BE: Both stories are about a young man’s journey of discovery whether it’s a castle or a farm on a desert planet. I grew up on a farm with the same feelings of wanting to leave to meet new people, have adventures, and discover what I might be capable of. I’ve always felt a connection with stories and movies like The Wizard of Oz and Star Wars. What I love about Star Wars is not only the idealism, but also the environments- the many species of life and creatures, the technology of spacecrafts and weapons, the sights and sounds. The strange brew of combining Shakespeare’s majesty and purpose of Hamlet with the rich fantasy of Star Wars shows not only that our lives are shaped by the people we meet and the choices we make to go right or left, but the clash of classic literature with pop culture can be a lot of geeky fun. Phoenix Theater, 2605 Hennepin Av. S., Mpls.